Having that special person - your best friend - is such an important part of life. We have talked to our kids about choosing a friend that is worthy (and being a friend that is worthy). Someone you can trust with your secrets, who has your back and is a help. Of course you want them to be a hoot to be around and someone you want to be around. 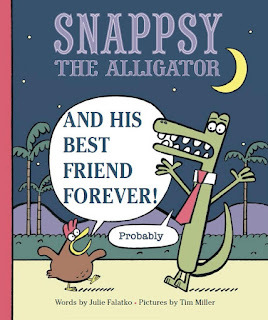 In Snappsy The Alligator And His Best Friend by Julie Falatko we learn all about friendship. Bert the chicken is Snappsy's biggest fan. He loves everything about him and thinks he is the coolest. Snappsy isn't the best of friends in the beginning of this book but he soon learns that Bert is pretty amazing and things are better with him around. I love how this story opens the conversation for what being a good friend is. The illustrations by Tim Miller are silly and fun which add to this adorable story. We had a blast reading it. protagonist. In their latest adventure, Snappsy and his loyal narrator discover the trials and error of friendship. You see, all Snappsy wants is a quiet evening to himself, but this pesky chicken (who insists he’s Snappsy’s best friend) won’t leave him alone. Friendship bracelets? Matching shirts? The sleepover of the century? Snappsy did not ask for any of this, but he might just be surprised at how nice it can be to have a friend.